Brown or white rice flour may be used as a gluten-free alternative to wheat flour. When baking a cake using rice flour, it is best to use white rice flour, according to Lisa Lewis, Ph.D. However, different brands of white rice flour vary in texture, with some being more grainy than others. You may need to experiment to find a brand of white rice flour that is similar in softness to the typical all-purpose flour. Spay the two cake pans with a light coating of non-stick baking spray. Mix together the margarine, sugar and eggs in a bowl until well blended. Combine the rice flour, potato starch flour, tapioca flour, guar gum, baking powder, baking soda and salt in a separate bowl. Pour the milk into a measuring cup and mix the vanilla extract into it. 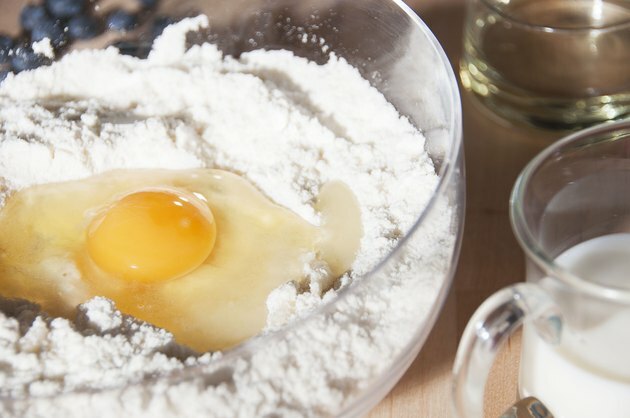 Add the flour and milk mixtures to the egg mixture gradually, using a low speed on your mixer and alternating between flour and milk. Mix just until well combined. Spoon the batter equally into the prepared cake pans. Bake for about 30 minutes, or until the cake is light brown and springs back when lightly pressed in the center. Cool in the pan for 5 minutes then turn out onto wire rack until completely cool.